Porcelain gallbladder refers to calcification of the gallbladder wall. It is a type of chronic gallbladder inflammation (cholecystitis) that is considered a risk factor for gallbladder cancer. A porcelain gallbladder does not function properly (does not fill with the bile) but rarely causes any symptoms . It is usually accidentally discovered during investigations for other abdominal problems, mainly in women after 50 [1,7]. 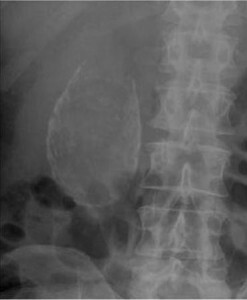 Porcelain gallbladder is rare; less than 0.1% of surgically removed gallbladders are calcified . When removed, a porcelain gallbladder looks brittle and bluish, like porcelain . A porcelain gallbladder is visible on an X-ray image; you can see a whitish oval shadow in picture 1 below . A computed tomography can provide most details about a porcelain gallbladder (Picture 2) . 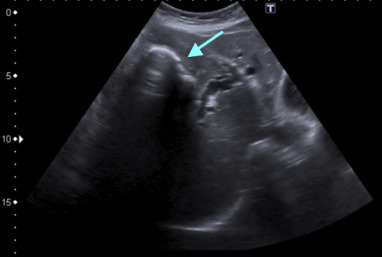 Ultrasound does not show a porcelain gallbladder very well; it can reveal calcified gallbladder wall and gallstones, though (Picture 3) . 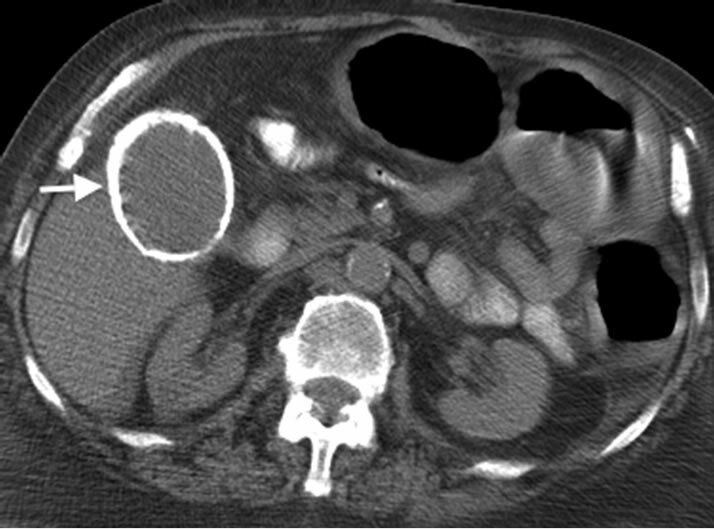 A calcified gallbladder wall (arrow) and a black “acoustic shadow” below it. It has been long believed that 12-62% of porcelain gallbladders develops into gallbladder cancer , but newer studies suggest that this may occur in only about 6% [3,5,7,8]. For comparison, gallbladder cancer develops in about 1% of individuals with chronic gallbladder inflammation without calcification . Patchy gallbladder calcification or”selective mucosal calcification” more likely develops into gallbladder cancer than diffuse gallbladder calcification or “complete intramural calcification” . The cause-effect relationship between porcelain gallbladder and gallbladder cancer has not been clearly established . Both gallbladder cancer and porcelain gallbladder share common risk factors (long-lasting chronic cholecystitis, old age), so it is not clear if porcelain gallbladder by itself is a risk factor for cancer [3,4,5,8,10,11]. Porcelain gallbladder is usually treated by surgical gallbladder removal .